First Nerve: Will Joe Jackson & Julian Rouas Stop at Nothing? 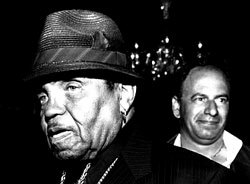 Will Joe Jackson & Julian Rouas Stop at Nothing? Joe Jackson and Julian “Franck” Rouas (of Julian Rouas Paris) have once again set a launch date for their Jackson-themed fragrances. On January 21, they will release the JRP/Jackson Perfume Collection. From a booth in the Las Vegas Fashion Show Mall . . . Without Michael Jackson’s name . . .
Hat tip to FN commenter Beatrice, who also pointed us to a site that is a treasure trove of material on Julian “Franck” Rouas. Police reports, lawsuits, eviction notices, credit reports and more. Links to our previous coverage. Parlux Fragrances: Deal or No Deal? This is What Democracy Smells Like?